The Grand Valley AVA is an American Viticultural Area located in Mesa County, Colorado, surrounding the cities of Grand Junction and Palisade. 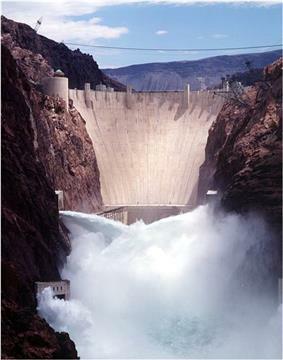 The AVA is defined as the irrigated agricultural area served by canals within the Grand Valley of the Colorado River. The AVA encompasses 32000 acres. 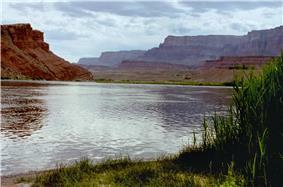 The terrain is varied, ranging from alluvial soils along the Colorado River to stony and loamy soils on mesas. Climate is high desert, subject to swings of temperature and wide diurnal variation. The AVA enjoys the most temperate climate within the state of Colorado, with the USDA cold hardiness zone ranging from 6 to 7. The eastern part of the AVA near the town of Palisade has consistent breezes that provide good air drainage, reducing the risk of frost. 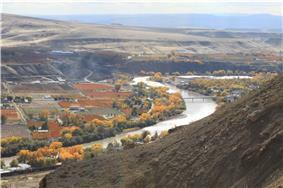 During the growing season, the valley has hot and dry days with lots of sunshine. wineries are located there. Vineyards in the valley are planted at elevations as high as 4,700 feet (1,400 m) above sea level. However, the continental climate somewhat limits the varieties used in grape production and not all varieties produce adequate yields. Grape varieties planted within the AVA vary widely and average yields are relatively low at about 2.5 tons/acre. Wine styles range from dry white and red wines, to semi-sweet and dessert wines, and even icewine. ^ Code of Federal Regulations. "§ 9.137 Grand Valley." Title 27: Alcohol, Tobacco and Firearms; Part 9 — American Viticultural Areas; Subpart C — Approved American Viticultural Areas. Retrieved Feb. 1, 2008. ^ Wine Institute, The (2008). "American Viticultural Areas by State". Retrieved Feb. 1, 2008. ^ a b Appellation America (2007). "Grand Valley (AVA): Appellation Description". Retrieved Feb. 1, 2008. ^ USDA. "USDA Plant Hardiness Zone Map""
^ Colorado State University. "Colorado Grape Statistics"
^ Colorado Wine. "Colorado Wine - Grand Valley AVA"